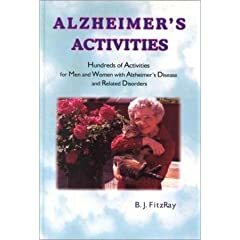 I recently received my copy of Alzheimer’s Caregivers . This free handbook and tip sheet is well worth obtaining. You can get up to three free copies so its also easy to share. Get your free copy. If you obtain the handbook, please let me know your reaction. Feel free to email this post to your friends and relatives. A University of Iowa researcher is conducting an Internet-based study to see if writing about their thoughts and feelings about care-giving can be a strategy to help those family caregivers reduce their stress. Newswise — For families who provide care to Alzheimer’s patients, stress and isolation can be a burden that’s hard to carry. A University of Iowa researcher is conducting an Internet-based study to see if writing about their thoughts and feelings about care-giving can be a strategy to help those family caregivers reduce their stress. Family members who provide care for patients with Alzheimer’s or other conditions of memory loss will be asked to write about their experiences related to their care-giving roles for 20 minutes on three occasions during a week. Participants in the study may write in their homes or wherever they have access to a computer that is most convenient to them. Participants in the study do not need to be “good writers” or worry about spelling or grammar because it is the effect of the writing that is being studied. As a means to measure the effect of the writing on reducing stress, study participants also will be asked to complete five questionnaires. Howard Butcher, Ph.D., UI associate professor of nursing and principal investigator of the UI Informatics Initiative-funded study, will evaluate whether expressing stress and other emotions in writing is a helpful way to deal with the often difficult emotions of caring for a loved one with Alzheimer’s disease or a condition that involves problems with memory. Written expression has been used with people who have experienced stressful and traumatic situations such as job loss, abuse, natural disasters and loss of a spouse. The strategy involves participants writing about their thoughts and feelings. Previous research by Butcher has shown that this type of writing promotes psychological and physiological health benefits after just three 20-minute writing sessions. The studies have shown that writing helps trauma survivors make meaning out of their life circumstances. This cognitive process can result in physiological changes in the autonomic and immune system by reducing stress and facilitating coping. For more information about participating in the study, visit https://swee.iowa.uiowa.edu or call Butcher at 319-335-7039. The following is an excellent article that I read some time ago in the San Francisco Chronicle. It is worthwhile reading. Hanging on like the mom of a new kindergartner, I watch my husband from the social worker’s glass cubicle. He is facing the piano player, the shrunken woman on one side of him, and on the other, falling asleep, the guy they call the Major. Ben — of all people — in that circle, a little dazed, being good, going along with the group, his new group. I can go home now and be alone for six hours. No TV, no one trailing after me. Shadowing, it’s called. He doesn’t always do it. Not yet. He nods his head in time to the blues, then Gershwin suddenly returns someone’s smile. It’s beginning to look like a good bet. Senior Access, it’s called, adult day care. This branch is in Novato, the best game in town as far as I know. I checked out every possibility that had a few men on the scene, not just a roomful of elderly ladies. Each time I took one look and said, “Never. Never Ben.” So how did never become now? Here is a moment, and for a change I recognize it. I will have a permanent memory of him joining the circle, lowering himself into the chair, eyes fixed on the piano, head bobbing immediately with the rhythm of the blues, then patting his knee as if he is soothing it. He knows he’s in the right place before I do. He’s one of them, not as far along on the Alzheimer’s road as some, still dapper in his crisp shirt and clean Dockers. But he is one of them. There is no going back to where he was, doing what passed for functioning at home, where he could still propel himself through the day with TV and frequent naps. He is ready; I’m the one not quite ready. From here in the cubicle, for the first time I see what “down the road” means: squeezing out every ounce of making it work at a level you can live with and then stepping down to the next level. Step, step, stepping along. This is a good thing, I say to myself on the drive home, and I shouldn’t turn it into dross because it’s a gift. It’s as close to what he needs, what we both need, as anything I could find, stimulation for him, a little freedom for me, twice-a-week freedom. Maybe we can work up to three days, who knows? And what will I do with the time and life this offers me? Catch up with two years of unfinished business? The house, the desk, the roses? Give way to a free-flowing all-out depression? There is a Costco just off the freeway and the car veers off to the nearest exit on its own. “What am I doing?” I ask myself, as I push a huge cart with three items in it: two plants for the garden and a polo shirt for him. “What am I doing, killing a morning like this, wasting it on shopping?” Guilt approaching panic is making my heart beat faster. I will barely get home and have to go back for him. Setting the plants near the front door with a thud that loosens the soil, I head for my desk. Checkbook and bank statement to my left, Italian class assignment to my right, I study the space between them until the phone rings. Sandra from the Caregiver’s Group. “Would I have time for a few brief questions?” I already had time for a few brief questions. She asks about my family. Are they helping me? Am I being good to myself? Answer on a spectrum of “Always” to “Never.” I answer with “Always” or “Never,” nothing in between. Sandra says she’ll call back another time. When guilt catches up with me, I am on the bike path above the creek, ducks swimming along beside me. Guilt rolls off our backs like you know what. Alone at last, I walk at my own pace. Fast. Fast is what Ben can no longer do — and fast is slow compared with the woman coming toward me as I near the marsh. She is wearing shorts and earphones. She smiles and I smile back. What a good idea this is, walking out in the sun and cold. What could produce better clarity? I don’t have to work it out the first day. I don’t have to do it right the first time. Then he opens his mouth wide, an expression of alarm in his eyes, his arms waving frantically. Abruptly he drops the pose. “It was …” he says again and waits. “Boffo?” I ask. He doesn’t answer. It is hard to engage him. “You mean every number was a showstopper? Over the top? Like Liza Minnelli?” He nods, slowly at first, then with mounting pleasure as I elaborate on the word “boffo” and I know one thing: He’s not all gone. Not yet. Persis Knobbe chronicles her journey with her late husband through his Alzheimer’s disease. Read her essay “Farmers’ markets can turn into lonely places” (Home&Garden, July 29) on SFGate or e-mail her at home@sfchronicle.com. Looking back, there is little doubt in my mind I should have realized my mother was suffering from dementia sooner. Sadly, I didn’t have the proper education, information, or frame of reference. Most people tend to ignore the early symptoms of the disease believing they are simply signs of “old age”. Anyone who ends up in my shoes knows and understands that a person in the early stages of Alzheimer’s can function normally–even drive a car. Only when they deteriorate or some “event” takes place do we wake up to reality. Behavior changes slowly in the elderly and as they begin to suffer cognitive impairment these changes are hard to detect. Sometimes these changes can be quite subtle but if detected raise a “red flag”. If my mother had been enrolled in any of the studies listed below, I feel certain she would have been diagnosed sooner. This would have allowed me to get her in an exercise program, get her proper nutrition, and insured that she was taking her medication as prescribed. I learned in the last four years how important these factors are in the quality of her life. 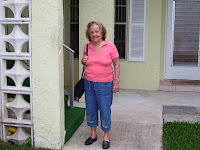 The woman in the picture is my 91 year old mother (yes the picture is current). She suffers from Alzheimer’s disease. I am her CareGiver. I ran across this factsheet from the Milton S Hershey Medical Center. The section entitled,What are the Symptoms, is particularly interesting. Dementia occurs primarily in people who are over the age of 65, or in those with an injury or disease that affects brain function. While dementia is most commonly seen in the elderly, it is not a normal consequence of the aging process. Dementia is caused by the death of brain cells. Brain cells can be destroyed by brain diseases, such as Alzheimer’s disease, or strokes (called vascular or multi-infarct dementia), which decrease blood flow to the brain. Lewy body dementia is another common cause attributed to changes in brain tissue. Other causes can include AIDS, high fever, dehydration, hydrocephalus, systemic lupus erythematosus, Lyme disease, long-term drug or alcohol abuse, vitamin deficiencies/poor nutrition, hypothyroidism or hypercalcemia, multiple sclerosis, brain tumor, or diseases such as Pick’s, Parkinson’s, Creutzfeldt-Jakob, or Huntington’s. Dementia can also result from a head injury that causes hemorrhaging in the brain or a reaction to a medication. In most cases, the symptoms of dementia occur gradually, over a period of years. Symptoms of dementia caused by injury or stroke occur more abruptly. Difficulties often begin with memory, progressing from simple forgetfulness to the inability to remember directions, recent events, and familiar faces and names. Other symptoms include difficulty with spoken communication, personality changes, problems with abstract thinking, poor personal hygiene, trouble sleeping, and poor judgment and decision making. Dementia is extremely frustrating for the patient, especially in the early stages when he or she is aware of the deficiencies it causes. People with dementia are likely to lash out at those around them, either out of frustration or because their difficulty with understanding makes them misinterpret the actions of others. They become extremely confused and anxious when in unfamiliar surroundings or with any change in routine. They may begin a task, such as cooking, then wander away aimlessly and completely forget what they had been doing. Dementia is often accompanied by depression and delirium, which is characterized by an inability to pay attention, fluctuating consciousness, hallucinations, paranoia, and delusions. People in advanced stages of dementia lose all control of bodily functions and are completely dependent upon others. Dementia is diagnosed through a study of the patient’s medical history and a complete physical and neurological exam. The doctor will speak with those close to the patient to document a pattern of behavior. He or she will also evaluate the patient’s mental functioning with tests of mental status, such as those that require the patient to recall words, lists of objects, names of objects, and recent events. Diagnostic tests, such as blood tests, x-rays, or magnetic resonance imaging (MRI), positron emission tomography (PET), or computed tomography (CT) scans, can help determine the cause of the dementia. In some instances, treating the cause of dementia may successfully reverse some or all of the symptoms. This is the case when the cause is related to a vitamin/nutritional deficiency, tumor, alcohol or drug abuse, reaction to a medication, or hormonal disorder. When dementia is related to an irreversible destruction of brain tissue, such as with Alzheimer’s disease, Lewy body dementia, or multiple strokes, treatment involves improving the patient’s quality of life as much as possible. This includes maintaining a stable, safe, supportive environment and providing constant supervision. 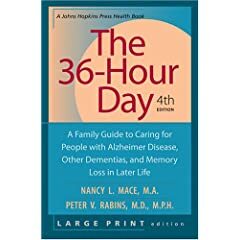 While this may be done in the home, people in the advanced stages of dementia may require round-the-clock care in a long-term healthcare facility. It is important to provide the patient with structured activities and avoid disruptions to his or her daily routine. Many patients enjoy therapeutic activities, such as crafts or games, designed specifically for people with dementia. Some medications, such as donepezil and tacrine, have been effective in improving the mental functions of those in the beginning stages of dementia. Patients with hallucinations and delusions may also be treated with antipsychotic drugs, while antidepressant medications are used to treat depression. There is currently no known way to prevent dementia associated with Alzheimer’s disease. You can decrease your risk of dementia associated with stroke by maintaining a healthy lifestyle, following a heart-healthy diet, and controlling high blood pressure and high cholesterol. Healthy lifestyles, including not smoking and not abusing drugs and alcohol, go a long way in keeping most people in good health. Caring for a person with dementia is stressful. It is important to learn all you can about the disease, seek the help of support groups, and find a responsible caregiver who can give you a break when needed. There are daycare programs specifically designed for patients with dementia that are good for the patient and the family. This is an important development for those genetically predisposed to Alzheimer’s. NEW YORK, Oct. 14 (UPI) — Researchers Sunday reported progress on development of a blood test that can diagnose Alzheimer’s disease, perhaps years before memory loss sets in. The researchers, mainly based at California’s Stanford University, said the test was about 90 percent accurate in distinguishing the blood of people with Alzheimer’s from the blood of others, The New York Times reported. The scientists said the test was about 80 percent accurate in determining which patients with mild memory loss would go on to develop Alzheimer’s disease during the next two to six years. The results were published online in the journal Nature Medicine.